NECLHG 1680-1760 is now International. How To Use An Axe. 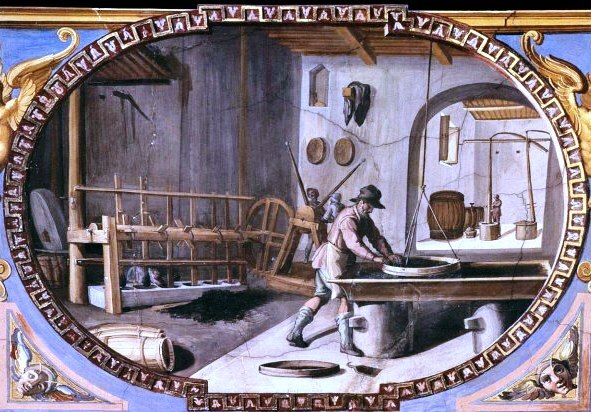 I just visited Longhunter's blog and he has this great image posted there. 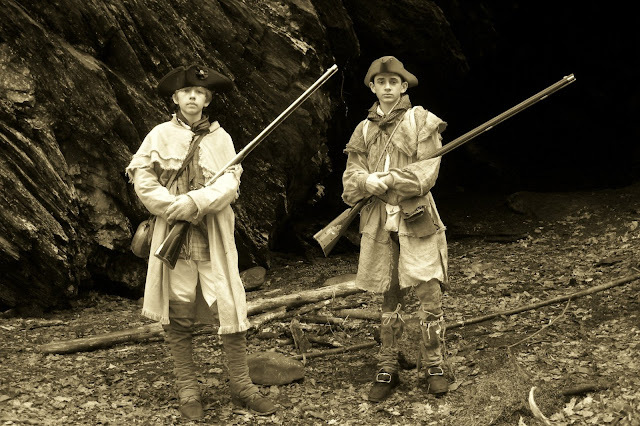 He and his mate are right into 18th century living history, and I think it is great to see these young men getting out there and doing it. So I thought I would share Longhunter's image with you here. Just look at their gear and dress, a first class effort. I wish they were living here so they could join our group, but at least now we have gone international, they may have an opportunity of joining one of our Chapters in America. Well done lads! Unfortunately there is no date on this one, but it appears to be a lock knife. 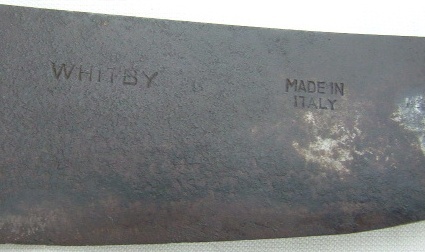 Blade markings: WHITBY MADE IN ITALY. 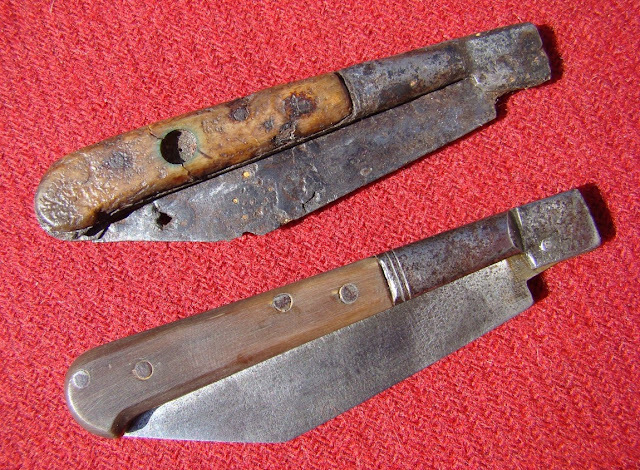 Two seaman's clasp knives with integral suspension rings and marlin spike. Marked 18th century, but I would guess early to mid 18th century. Another suspension ring clasp knife marked 18th century. 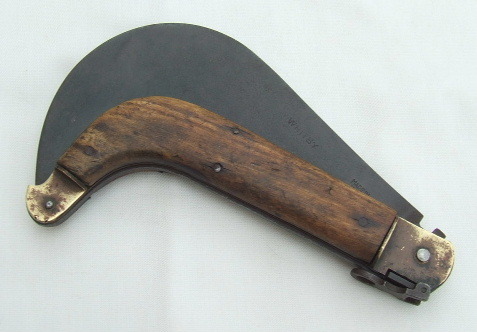 This one has a wood handle. This one is of unknown origin. All metal. My guess would be another seaman's knife looking at the fish tail. Also of course a suspension ring type. 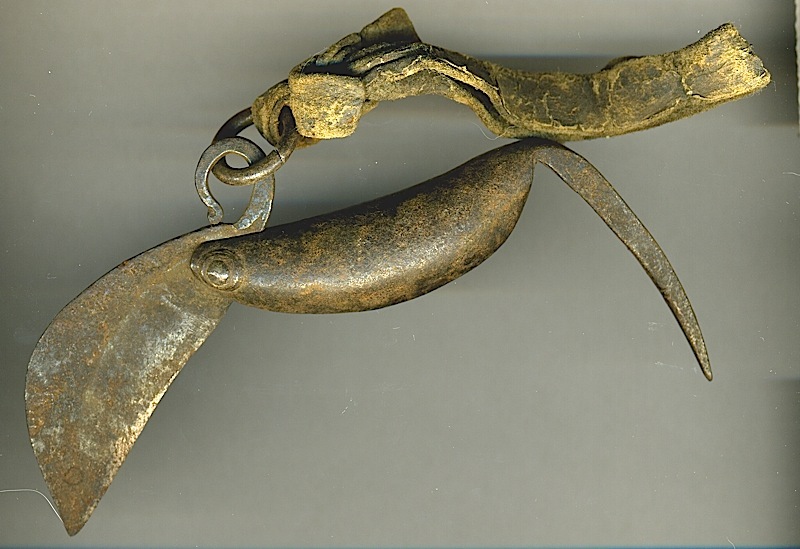 The clasp knife dates back to the Romans era, but the knives we are concerned with here are 17th and 18th century. As with any description of an antique item of which there were many makers, there may be some grey areas regarding shapes matched to periods. 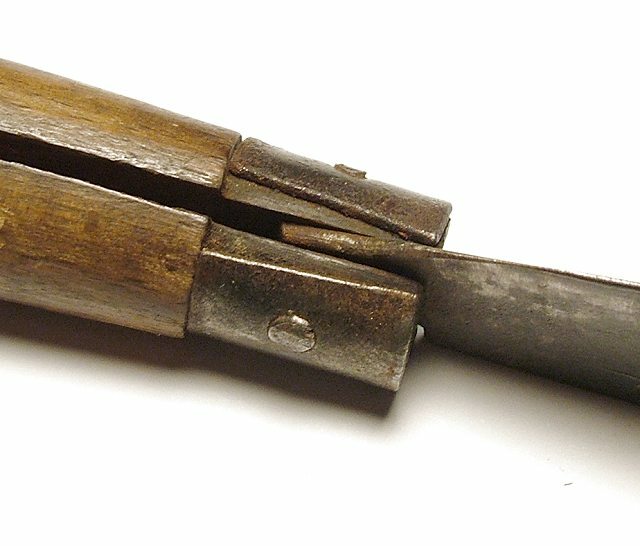 The pistol grip clasp knife fits into the early to mid 18th century, but of course their use would have gone beyond this date. The curved design seems to date to the late 18th century. 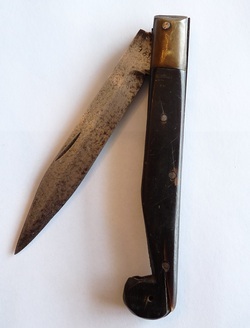 But in the 19th century the shape of the clasp knife handle became straight, with no curve. 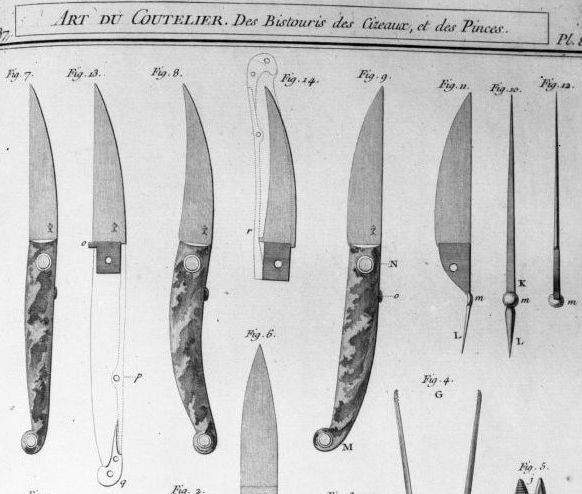 17th century pistol grip knives. 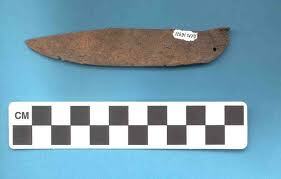 17th century pistol grip Gully knife. 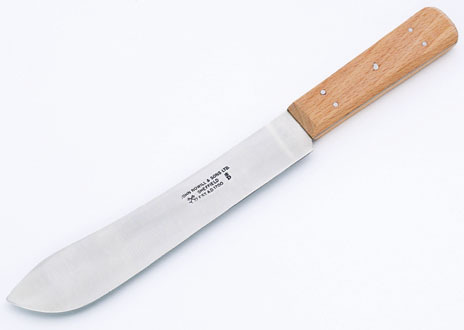 Considered to be a fighting knife. I am unable to tell if this has a back spring or not. My own knife of similar size does have a back spring, but the blade is so long that the spring is pretty much ineffectual. 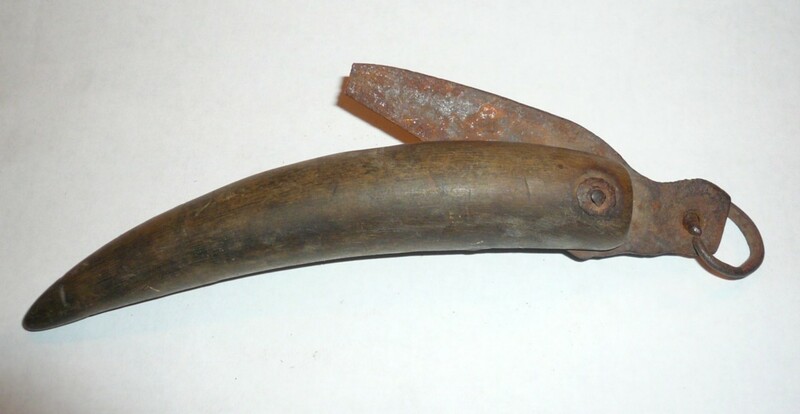 18th century French pruning knife. 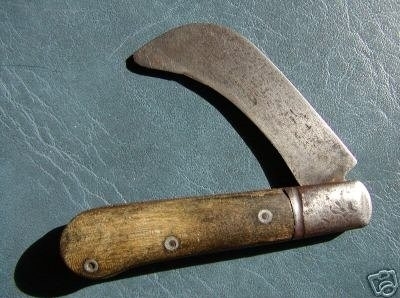 A similar knife of mine with bone slab handle. 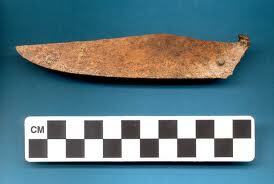 Found at a site of the Conoy Indians in Lancaster County which dates from 1718 to 1743. This one is dated to the 1770s. 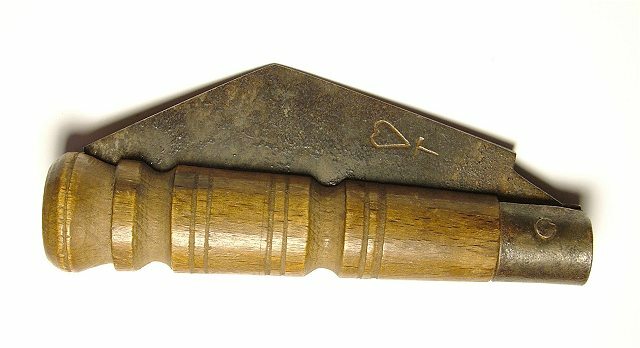 18th century Spanish or Catalonian or Balearic lock clasp knife. The lock is released by pulling on the ring at the back of the knife. 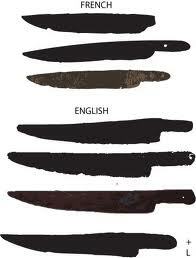 This diagram of Lentega knives are very similar to the Jambette knives. 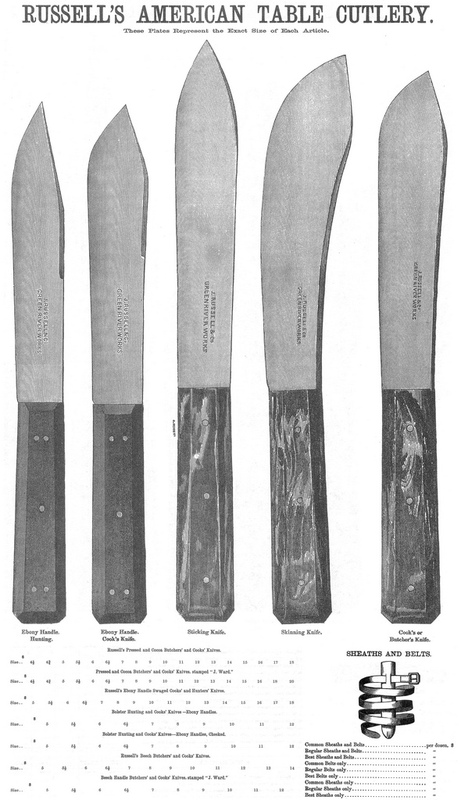 These are friction knives the same as the Jambette, no back spring, and no lock. 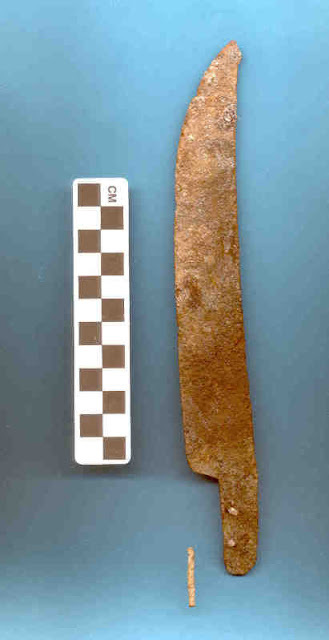 The back of the blade had a tab to restrict travel of the blade, and pressure on this tab area with thumb or hand secures the blade in the open position. 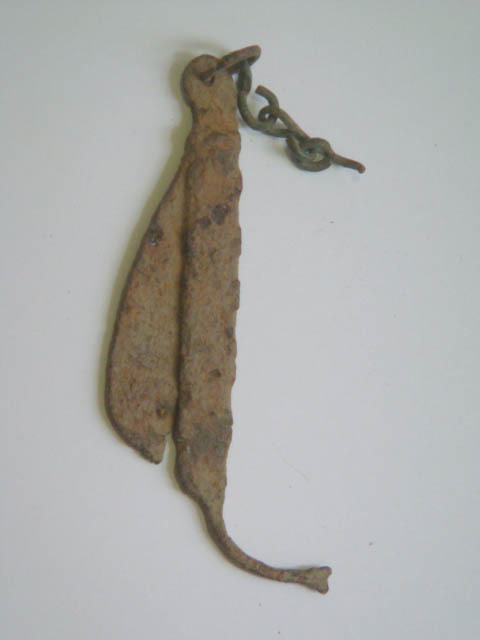 This early to mid 18th century suspension ring blade is believed to be Spanish. These operate the same as the Jambette. This is the copy I made for this type of knife. The custom takes place every year on the eve of Ascension Day and dates back to 1159 when three noblemen were hunting a wild boar. The boar is reputed to have sought refuge with a hermit on Eskdaleside but the three hunters attacked the hermit and killed him. As penance for their crime the noblemen were told they must build a hedge, cut with a penny knife, at low tide. 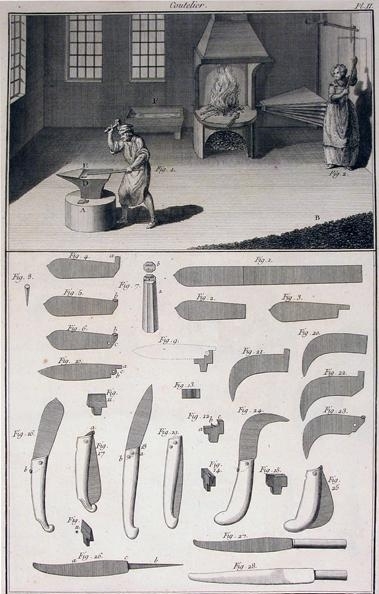 French cutlers images published in 1771. I decided to make a plug Bayonet for my 20 gauge fusil. This gauge is fairly small, so the bayonet needs a small handle. I started making a wooden handle, and then had an idea. Why not use a corn cob handle? My corn cob handled Hunting Plug Bayonet. 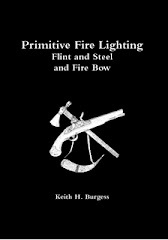 Foraging and Hunting. Bush Tucker. Australian Aboriginals Hunting The Flying Fox/Fruit Bat. Today a friend in the States contacted me and asked me about knives, he had been watching the History Channel, and they had shown a knife with rivets securing the handle. Glen remembered what I had said regarding period knives being pinned and not riveted and so contacted me to see if I had any more to add to my previous research. Here then is what I have so far. Rivets were added in 1874 so the pockets carrying all those rock specimens could hold up better. 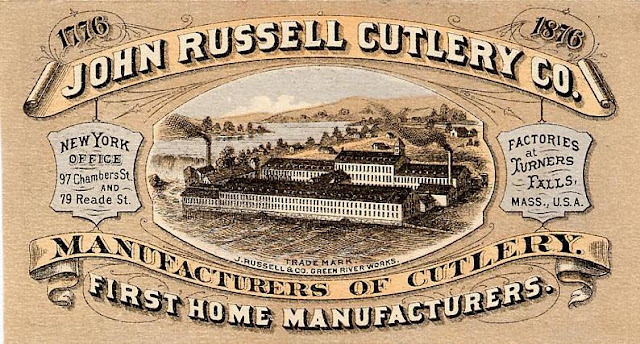 with the invention of the “big fat” brass cutler's rivets of the 1890s. Even in the early 20th century butcher knives were being made using pins and not rivets. Modern copy of a 19th century Sheffield butcher knife. 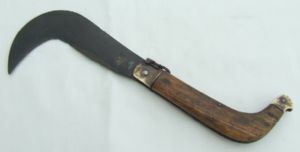 Wilson catalogue knife circa 1900ad. 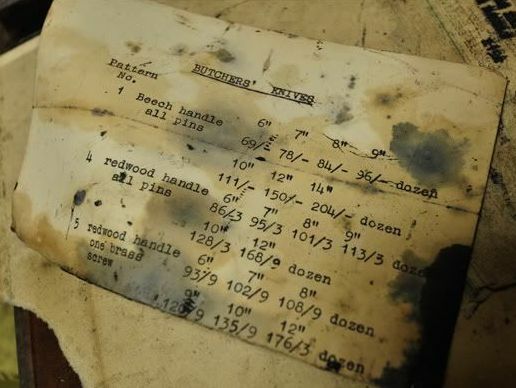 This to me looks like a typewriter written page, yet it is still listing knives with pinned handles, not riveted. Three of my 19th century knives with 5 pinned handles. Two copies I made of 18th century butcher knives using 20th century carbon steel butcher blades. Both using just three pins to secure the handles. 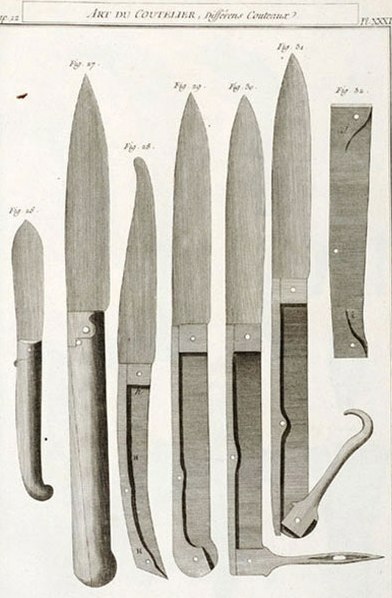 17th century knives. 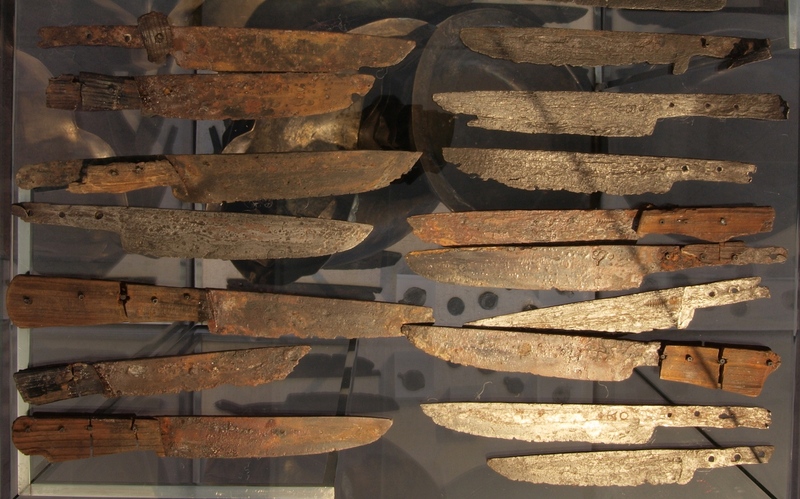 A variety of 17th century knives, with 5,4 and 3 pins securing the handles, but unlike the 19th century knives, these pins are all in-line. Videos on Identifying Punk Wood Tinder. The Knapsack and Knife of TwoTongues. Settlers. Tools, weapons, and carrying. Adam's Gunpowder Canister. Can you identify it?